Ellen was a joy to work with, very professional and attentive to details. She knows how to bring your beauty shining through and know what works for you to enhance it. You tell her the look you’re going for and she lets know you what’s best. Also, she’s just what you need to relieve nervous tension on that big day and I loved her relaxed nature. B.T.W. My 7 yr old ring bearer said I looked like “Michelle Obama” lol, meaning I looked all different and brand new. Ellen did my make-up for my September 2013 wedding, and from the very start of my trial run with her, I knew that I was in good hands. Ellen is a great listener, and after discussing what I had envisioned for my make-up, she created a really beautiful look. 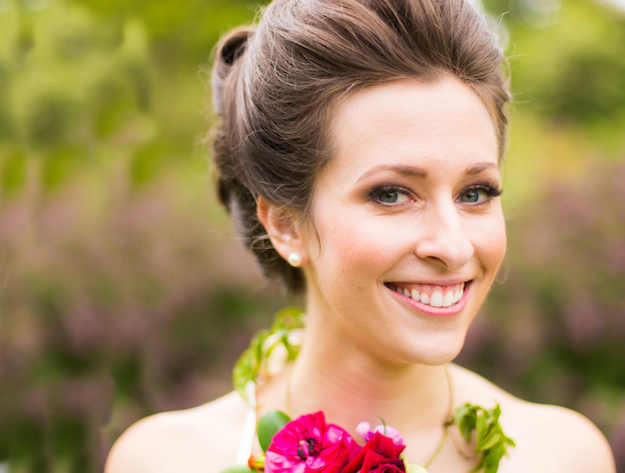 Wedding make-up artists in New York can be pricey, but Ellen’s rates are incredibly fair and the results are incredible! Ellen used airbrush makeup for me and my party, and everyone looked flawless. She made the whole process easy, streamlined and fun. Her outstanding reviews are well-deserved! I loved working with Face the Day NY. The staff feels like hanging out with girlfriends and they all are so talented! They were so great to me and my entire family. Our wedding wouldn’t have been the same without them. Ellen and her team are so amazing, and anyone would be lucky to have her do make up for their special day!! I completely recommend face the day NY 110%. My partner and I came from Australia to wed in Central Park. Ellen and the hairstylist, Najeebah, were so punctual, sssooo friendly, and her work was flawless. Thank YOU for making me look and feel my best on such an important day in my life. Best of luck to you in all that you do. Please feel free to read through all the Face the Day NY testimonials and to contact me today! Special thanks to wedding photographers: Tara Sharma, and more.